OUR NEXT meeting for members who have recently started freelancing is on Thursday 25 April. It's from 6pm at the Camera Museum, Museum Street, London WC1A 1LY (map). We had a full house for the last new members' meeting on 31 January, as the photo shows. 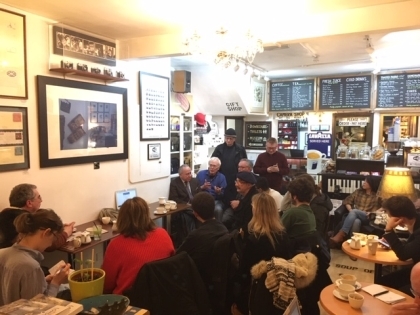 Freelance organiser David Ayrton joined Branch committee members Phil Sutcliffe, Francesca Marchese and Larry Herman - and 18 new members joined us during the hour-long meeting. Six were university students and three photographers; seven were women and four seniors. We discussed: the Rate for the Job; how to write an invoice; how to pitch and follow up pitches; the best ways to present yourself; the Freelance Directory which is free to NUJ freelances at www.freelancedirectory.org and what new members can get out of attending branch meetings and courses organised by the branch and those from the Federation of Entertainment Unions.